Most everyone loves a comeback story–somebody really messed up their life, or lost badly in sports, or made a terrible decision, or failed at something. But then instead of that being the end of the story, they change, they turn things around, they humbly learn from their faults and things are made right and good in the end. Deep down we believe everyone deserves a second chance–for we know how many times we ourselves have needed second chances. And in many ways, that’s very much a Scriptural notion. We heard in last week’s epistle about how the Lord’s delay in His return is because of His longsuffering patience and His desire that all come to repentance. He doesn’t want anyone to perish eternally, but for all to be saved and come to the knowledge of the truth. We know that parable where even the workers hired at the 11th hour receive the denarius of salvation. Our God is indeed the God of the second chance, and the third and the fourth and the 490th chance. He is a God of patience and forgiveness and grace. However, there will come a time when 2nd chances will finally run out. Jesus’ parable of the 10 virgins is an example of that. They only had one opportunity to get it right. And when the bridegroom comes late, the oil of the foolish has run out, the storekeepers’ shops are closed, and the door to the marriage feast is shut–and there are no do-overs or turning back the clock. This, then, is one of the messages of today’s Gospel. We dare never presume upon the grace of the Lord. What a foolish thing it is to say, “I’ll take the things of God more seriously in a few years, later on. Right now I’ve got to focus on other things.” Tell me: how do you know you’ve got a few years to work with? Do you know the day of the Lord’s return or the day of your death? How can you give so much attention to your worldly loves and assume that the things of the Lord can be taken care of at some point in the future? It is a foolish notion to think that you can schedule your repentance and put it off for later. That is perhaps the most silly and dangerous thing of all. If you are willfully clinging to your sin now, willfully putting off repentance until some nebulous future point, what makes you think your heart will suddenly be repentant later? Resisting the work of the Holy Spirit is a dangerous game. It numbs the conscience and deadens faith until finally you no longer feel your need for repentance or forgiveness or Jesus at all. Now is the time; now is the day of salvation. Now is the moment for repentance and watching and receiving the Lord’s gifts. Now is the time to be wise in this foolish generation. In the Scriptures, wisdom is not equated with a high IQ or great learning. One may be wise without being academically smart. Many of you have seen this in folks from generations past, who may not have even finished gradeschool, but who had a humble and insightful wisdom that some with doctorates don’t possess today. In the Bible real wisdom is seeing things–seeing all of life–from God's perspective, having the mind of Christ as St. Paul puts it. Our Lord tells the story in Matthew 7 of the wise man who builds his house on the rock. Jesus says, “Therefore whoever hears these sayings of Mine and does them, I will liken him to a wise man who built his house on the rock: and the rain descended and the floods came, and the winds blew and beat on that house, and it did not fall, for it was founded on the rock.” In other words, the wise man knows that only a life built on the words of Jesus will endure, for even though the heavens and the earth pass away, His words will never pass away. It is no wonder, then, that Moses prays in Psalm 90 saying, “So teach us to number our days, that we may gain a heart of wisdom.” Moses’ prayer is not simply that we might be smart, but that we might see our fleeting days from God’s perspective. Five of the virgins are wise. They do not merely live for the moment; they live with their hearts set on this most important wedding event. They do not know at what hour the bridegroom will come and lead them into the wedding hall. They do not know when the party would begin. But they know that the bridegroom is on His way and that they are his invited guests. So their lives are lived toward that wedding. Nothing else is as important as that event. So they are prepared for the wait. They check their lamps. They buy extra oil. Their flasks are full. No doubt they seemed a bit foolish carrying around those extra jars of oil. Perhaps they were told stop burdening themselves, to loosen up and have a good time and not to be so extreme or obsessive. 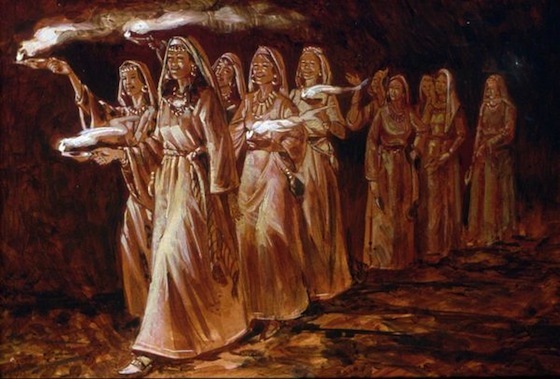 Nevertheless, these wise women paid attention to the oil; they were prepared for the delay. And when the bridegroom finally arrived, they were ready to take part in the marriage feast. For the five foolish virgins it was too late. There was no more opportunity to purchase oil. They were unprepared for the feast and unable to enter into the joy of the celebration. The door was shut, and they were excluded. What does this mean for you? Jesus' own explanation of the parable says it all, “Watch therefore, for you know neither the day nor the hour in which the Son of Man is coming.” Watching does not mean that you should be speculating about the day or the hour. History is full of failed predictions about the end. All you are given to know is that Jesus’ return will come suddenly and unexpectedly, like a thief in the night, like the flood in Noah’s day, like the destruction of Sodom and Gomorrah. All you are given to do is to watch, to be ready, to devote yourselves to the worship of Christ and the receiving of His gifts. To watch is to believe and to hope in His promises. The Word of God is the lamp to our feet and the light to our path. It is filled with the oil of the Holy Spirit, who makes us wise unto salvation and keeps the flame of faith in Christ burning brightly. To watch is to be vigilant about the things of Christ, the life-giving gifts which He purchased for us with His holy and precious blood. A church that ceases to watch will lose the Gospel. A church that becomes lazy or complacent regarding God’s doctrine is in danger of losing the teaching of Christ, falling from faith. Therefore, the Apostle Paul writes to Pastor Timothy and all pastors: “Watch your life and doctrine closely. Persevere in them, because if you do, you will save both yourself and your hearers” (I Tim. 4:16). Our watching is not a gazing up into the heavens, but attentiveness to the voice of our Good Shepherd as He speaks to us in His Word. We are now living in that evil age which Paul spoke about when he said, “For the time is coming when people will not endure sound teaching, but having itching ears they will accumulate for themselves teachers to suit their own likings, and will turn away from the truth to wander into myths” (II Tim. 4:3). We are to watch by holding fast God’s Word, hearing it, learning it, and taking it to heart. Right now is the evening of the wedding feast. Right now is the time when you still have access to the oil. It is available to you in overflowing abundance. For the forgiveness of sins purchased by our Savior through His atoning death on the cross is enough for the whole world, for all of you; it covers every single one of your sins–none left out. There is no shortage of supply in His grace and mercy. This oil of the Holy Spirit is distributed now in the preaching of the Gospel and the giving out of Jesus’ body and blood in the Holy Supper. The wise cannot get enough of these. They never say, “Oh, I can skip a couple or three weeks of church.” For they always desire more of Jesus. And the more we get of Him, the more ready and eager we are to receive Him when He comes again in glory. Remember that the One who is coming is your Redeemer. He is the One who in His first coming willingly suffered for you in weakness to break the power of the curse over you. He is the One who loves you and forgives you. He is the One who comes not in wrath and judgment for you who believe but to bring you the fullness of joy. When all is said and done, when we have properly been shaken down to our souls with the urgency of the call to watch and the finality of what will happen on the Day of Christ’s return, we also then need to take a deep breath and let it out with a joyous laugh. Because what we are watching for is a celebration. The unknown day and hour is not a dreadful time for the faithful; it is the ultimate day of happiness that we eagerly seek and look forward to. It is the ultimate holiday, the holy Day when the Lord, whom we love and trust in, is revealed, and when we get to be with Him and revel in His presence. If being reunited with loved ones for the holidays and just spending time together can bring great happiness, how much more will that be true of the return of our Savior? The Lord who is coming is not like that snooty relative who walks around finding all the flaws in your house and who is eager to give advice on how you should do things better. Rather He is like the uncle who always brings the funniest gifts and tells the best stories and who you just like hanging around with. Make no mistake, the One who is coming is your God and your Lord to whom you owe the greatest reverence. But He has also made Himself to be your flesh and blood. And so we do indeed need to watch for His coming; not as a burden, though, but as a joyful thing. For we eagerly are looking forward to the merriment of the wedding feast.